Sarah Jane Barker was born April 24, 1861 at 3:30AM at Devonport, Devonshire, England. Her parents were Joseph Barker and Mary Ann Doidge. She was blessed by George Staniforth, May 27, 1861 and baptized 22 June 1873 by William Holyoak and confirmed by Harman Balis at Parowan, Utah. Sarah’s parents joined the Latter-day Saint Church at Devonport. First her mother was baptized in 1857 before she was married. Later Joseph was baptized in 1860, just a little before he married Mary Ann Doidge. He, at this time, was a Private in the Queens Army stationed at Devonport. He was born in Bramley, Yorkshire, England, 29 September 1835. His parents lived at Leeds, England and the father worked in the woolen mills there.Joseph, Sarah’s father, became a tailor before he joined the army. The problem of finding a way to cross the plains to Utah confronted them when they reached America. Joseph found a way to go by driving a team of oxen with a load for a man, but there was not room for Mary Ann and the baby to go along. They decided he had better go and they would follow later. He could prepare a place for them to go when they reached the valley. Three weeks later, Mary Ann found an opportunity to send her belongings and her baby on a wagon by agreeing to do the washing for the captain of the company and his family along the way. There was not room for her to ride, so she walked almost all the way across the plains to Salt Lake City. In Utah some kind friends named Moody took them in until they could get settled in a place of their own. Soon they moved to the Parowan settlement in South­ern Utah. Here Sarah’s father had to take any job he could find—herding sheep, hauling freight to the mining towns in Nevada, or keeping a small store in part of his home. There was not much demand for tailors in a small frontier town. Mary Ann also helped all she could to obtain the necessities of life for their family. She went out and did housework and washing for the more well to do financially. Mary Ann also taught the neighborhood school children by day, and a writing school for adults by night, and took produce or anything that would help with the living. The children went into the fields with their mother to glean wheat to grind for bread. They also gathered wool from fences. Sarah was the oldest child of six girls born to Joseph and Mary. She must assume a great deal of responsibil­ity of caring for the younger children while her mother worked. She told of carrying the baby sister to the place where her mother might be working for it to be nursed. The names of her sisters, in order of birth, are: Mary Ann, for her mother, Emma Amelia, Catherine Maria, Ellen Melissa, Georgina Madora. They all came along about two years apart—six little girls. Each little girl had to learn early to do her share and more, for at eleven and twelve years of age, they were sent out to help in different households for their board. In 1872 Joseph and Mary Ann made a trip to Salt Lake and were sealed in the endowment house. The children were not taken, as there were no sealings done for children there. They all have been sealed to their parents at a later date. About 1876, Joseph Barker went out to Pioche, Ne­vada, hauling freight to the mines to try to make money for his family. He stayed on there and asked his wife to join him, but her Bishop advised her not to take her girls and go there because of the rough element there. Therefore, they became legally separated. Later Sarah’s mother, Mary Ann, married a man named James Harvey Dunton. Mr. Dunton already had a wife and lived in Paragoona, near Parowan. He was called near this time to go to help settle the San Juan country. He went with the first company down through the hole in the rock to Montezuma Fort, and on to Bluff, Utah. The second trip he took Mary Ann and her two young­est daughters and a baby son named John Harvey Dunton. They left the four oldest girls to work in Parowan and places about Southem Utah. Sarah went to Washington and worked in the cotton factory. Here she had chills and fever very bad. Later she worked at the mining town of Minersville. Catherine worked for Bishop Dame’s family. For several years they were away from their mother. 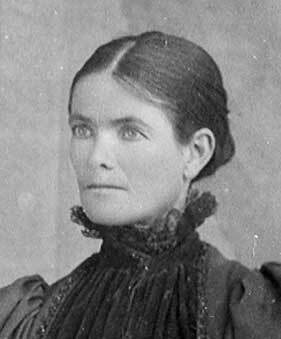 When Sarah was 20 years old, the Dunton’s sent for the four girls to come to Mancos, Colorado, where the family had moved from Bluff, Utah. On the trip to the San Juan, the girls crossed the Colorado River at Lee’s Ferry and had to be ferried over on a ferryboat. They enjoyed the crossing so much that they went back on the empty and crossed the second time. At Mancos they lived in a dugout for a while and, as the family was large, the girls had to go out and obtain work for their living and to help support the family. They were willing to do this so they could be nearer their mother and little sisters and little half-brother. Sarah worked at different places, all for families who did not belong to the LDS Church, and she was com­mended for her conscientious and efficient work. Sarah did sewing for herself and the younger members of the family. She made skirts with 11, 13, and 17 gores and the waists called basques were cut with gores and boned at the seams. The sleeves were leg-o-mutton and many times the waist was lined. They had poor lights and much of the sewing she did was at night and her eyes became very weary. There were not many Latter-day Saints living in Mancos country at that time. Mr. Dunton was the first Branch President of the Mormon community, and Mary Ann was a Relief Society President and taught in Sunday School classes. She also later taught school for a time, as did her youngest daughter, Dora, when she was a young lady. As Mr. Dunton had a family in Paragoona, Utah, he did not stay long with Mary Ann and her children, but left them to support themselves. Sarah was the oldest child and took much of the responsibility of helping the family financially. A large family named Devenport came to Mancos from Nevada in 1880. They were not members of the Church. Sarah met William McDonald Devenport. He was friendly with the Mormon boys and often went to Grandpa Charley Willden’s home with his boys. There Mr. and Mrs. Willden talked to him about the Mormon Church and he became converted. Also, he fell in love with Sarah who was a Mormon girl. They were to be married, and he surprised her by telling her he was going to be baptized into the Church. He was baptized 28 August 1885, by Bishop Al Farnsworth, and was married to Sarah Barker December 14th of the same year by F. A. Hammond. William was a very faithful member all of his life. None of his family ever joined the Church except him. His mother died of rheumatism before he was married and left her large family (of 13 children). After Sarah and William were married, they went to live on a farm near what was called dog town. It was a settlement of mostly Mormons and a log church house was built there to hold meetings and for social gather­ings. Sarah’s husband had poor health in those early years of marriage and at one time was so ill that the President of the Branch, Brother A.L. Farnsworth, baptized him for his health. He was immersed 8 times in succession. This seemed to be a practice of the early days of the Church to give baptism for health in serious afflictions. William Devenport told how he was immediately healed from the disease and never had a recurrence. He always had great faith and many times in illness in the family, the priesthood was called to bless them. Sarah was the mother of six girls before she had a son. She followed the same pattern as her mother, Mary Ann, had, as she also had six girls then an only son. Sarah and William’s first child was born October 9, 1886 at Mancos, where they lived on a farm. This child lived to the age of almost seven and died of the dread disease, sugar diabetes. There was no known remedy for the illness in those times. This child was named Mary Estella. She was a lovely child, with beautiful brown eyes and hair, which hung in ringlets. She had just started to school that year. Sarah suffered much from the loss of this child. A second daughter, Bertha, was born September 18, 1888, and was a great comfort to her parents. She grew to be a beautiful child and a very bright spirit. This girl married Clark Roberts in 1914 and he was killed in an accident six weeks later driving a team of horses. Bertha never married again, but became an excellent schoolteacher. Myrtle Melissa was the third daughter. She married Charles Edwin Dean in 1913 and had five children, and is still living. She lives in Provo, Utah at the present. Dora Elizabeth was the fourth girl, another lovely daughter that was not permitted to live too long. She also died of diabetes when she was almost sixteen, February 19, 1908. She was the first to be buried in the Mormon Cemetery at Redmesa, Colorado. Her grave had to be made when the snow was three feet deep and the roads almost blocked with snow, in nothing but a corner of a sagebrush field. Her parents’ sorrow was assuaged only through their faith in God and that they would again have these children in the future life. Ida May was the fifth daughter. She was called “laughing eyes” as she had such a smiling face and sunny disposition. She became the mother of three children, and now lives in Salt Lake City. The sixth daughter was a tiny girl, born prematurely, and only weighed four pounds. They named her Sarah Wilhelmina and called her Willie for her father, as they had given up getting a boy. She was a delicate baby and only lived five months. Sarah accepted the fact that her children were all girls. She always asked, “Are they all right?” and when assured they were fine, she smiled happily and was grateful. On the 20th of December 1902, a happy family greeted their first son and brother. It took a long time to find a name for the long awaited son. Finally he was named Karl William and they called him Karl. He grew to be a tall, fine man and a great joy and comfort to his family. He had only two sons. He now lives in Ucon, Idaho. He has been very active in the Church. He filled a Northwestern States Mission and has been a Bishop and a High Councilman. As most women, Sarah never was attended by a doctor for her children’s births. A dear old lady mid­wife, Aunt Hannah Perkins, was always called to care for them. The family went through many pio­neering experiences and worked hard for a living. There was always the farm work, and the family moved many times about from place to place trying to better financial conditions. In the summertime, for many years, they moved to the Mancos Hills and took a herd of cows to run a dairy. Sometimes they made cheese to sell to the town stores; sometimes it was cream they separated that they took to town to the market creamery. At least they always had plenty of good milk and butter and cheese for the family. One of the homes they lived in was almost on the shores of a small lake (Webber Lake). They built quite a large house here, partly of hewn logs and a lumber kitchen and bedrooms added. Here the family milked quite a few cows and had ducks, turkeys, chickens, and horses. This was a happy time for the children especially. It was fine swimming and skating at the lake, and the young people of the surrounding villages came to join the fun. Also, most of the Church children came to this lake to be baptized. They would run to the house to be warmed and dressed after baptism. Some came in January and February and the deep ice had to be cut away, but they wanted to be baptized on their birthday. Will rode the range after cattle and broke bronco horses, causing Sarah a great deal of worry. One of the bad horses bit William’s finger until it was necessary to have it cut off. The children walked to school about a mile or more away. Snow or shine, they did not seem to mind. Children in those times learned they could walk and parents did not have time to coddle them. But they loved them dearly, and were concerned for their health and happiness. Sarah’s mother, Mary Ann, loved William very much as he was very kind to her, and after her second husband did not care for her longer, she always had her home near her oldest daughter. Every move the family made, Grandma Dunton had a house nearby. One time she even had her house moved by horses pulling it after they had placed it on long logs to make the skids for it to move along. The children all loved their Grandma and, as she grew old, they stayed with her to help with her work, each liking their tam to go. The last home for the Devenport family in the Mancos Valley was a nice brick house that William built mostly himself. It had large rooms and three bedrooms and a big fireplace. They put a big folding door between the living room and dining room. Sarah and William both loved flowers, and here they had a large flower garden of many kinds of lovely flowers. There was also a berry patch and garden in back and then several acres of orchard and fruit trees. This home was just a little way from the church house. Here the girls were getting the age to go to parties and dances. But the parents were strict and they must always be home near ten o’clock from parties, but a little later for dances. The parents of the community most all attended the dances with their children, sat on the sidelines to watch the dances, and William also loved to dance, and did so with his daughters. Sarah and William were always active church members and set that example to all of their children. Their greatest desire for their family was that they would all be good Latter-day Saints. As there was no temple near when Sarah was married, they had six children before they got to a temple for the family to be sealed. They had little means for such a trip to Salt Lake City, but in 1900 they took their family on the train to the temple. Baby Willie was only three weeks old, and Sarah was not yet very strong and the baby was tiny. They placed her on a pillow and she stood the trip without harm. They sold three or four of their best cows to finance the journey, but were always grateful that they could claim all of their children for time and eternity if all proved worthy. The family lived in different homes in Mancos Valley until 1908. Then they moved to a new settlement in Colorado that had been opened for filing on govern­ment land (Redmesa, Colorado). Several Mormon families were the first settlers here. Hoping to gain financially and hearing that it was a fine place to raise good Latter-day Saints, William and Sarah moved here with their family. Sarah was less in favor of the move than her husband. He was a good worker and again built a brick home with the help of his children, who carried mortar and bricks as he laid them himself. The children were happy here and there were many young people their age to associate with. The ward was strong in faith and works. Only a few smoked and no one drank liquor. There was much opportunity for each member to work in church positions. Sarah was the second Relief Society President of the Ward, called Redmesa Ward. The soil was very red but fertile and raised good gardens and crops. Yet there was usually a shortage of moisture. William was the first Ward Teachers’ leader. He was a Counselor in the Sunday School, and later a High Councilman of the Stake, called the Young Stake. The girls all taught classes in Sunday School, Primary, or Religion Class, and M.I.A. From this home, the girls were all married, though they must travel to Salt Lake City to the temple for the ceremony. The girls were all married, and in 1923 William and Sarah took their son and moved to Provo, Utah. Karl had received a call to a mission to the Northwestern States. Bertha was teaching at BYU and, as the days for hard farm labor were over for them, they went to live with their daughter. After Karl returned from his mission, he finished and graduated from BYU. Then he went to Rexburg, Idaho, to teach in a high school. He married a girl, Hester Warner, of Rexburg in 1930 and remained in Idaho teaching later in Ucon. Here he was a Bishop for several years and a High Councilman in the stake and a worker in the Idaho Falls Temple. He has also been Assistant Superintendent of Idaho Falls Schools. William died in January 1928 following a serious operation, and Sarah remained with Bertha the rest of her years. At intervals she spent some summers in Colorado or Idaho or Salt Lake with her other children. Sarah’s eyes failed first from cataracts, and before she died she lost her vision entirely. She had an operation on one eye in Salt Lake, but it was not successful. She was patient and kind and bore her trials uncomplainingly. She was a wonderful mother and loved and sacrificed all her days for her family. Sarah Barker Devenport died suddenly 1 April 1939 at her daughter Bertha’s home of a heart attack. She had previously had a stroke several years before, but recovered. She was buried in the Provo City Cemetery. Four children and nine grandchildren and three great­-grandchildren survived her.